Irregular periods with heavy bleeding and cramps are a source of frustration for most women approaching menopause. Menstrual irregularities can last for up to ten years while hormone levels are altered in the body in preparation for menopause. Irregular periods are difficult to accept, as they are often the first outward symptom in a series of physical and emotional changes that will take place as the body adapts for menopause. Meditation offers a healthy way of dealing with these changes and helps relieve painful cramps associated with menopausal irregular periods. Meditation has a largely Eastern heritage; it is a practice historically tied with spirituality and religion where a person assumes a specific position and focuses their mind to achieve a relaxed effect. This is sometimes done using a mantra, a word - or set of words - to concentrate on to aid the process. Nowadays, meditation is increasingly regarded as a practice with significant health benefits, and these are employed in medical culture as well as for spiritual and religious purposes. Meditation is a process that has a considerable calming effect on the nervous system, which prompts a state of physical and emotional relaxation. This helps with psychological balance and relieving emotional stress. Meditation encourages a mindful, non-judgmental observation of thoughts, feelings, sensations, and distractions, which can alter the way a person relates to their flow of emotions and thoughts outside of meditative practice. How Can Meditation Help My Irregular Periods? Irregular periods are an early sign that a woman is nearing the end of her reproductive life; they signal the beginning of a series of significant changes in her body as she begins her journey towards menopause, so it is natural to feel a little sad around this time. Meditation can help a woman come to terms with these emotions by helping her to achieve a state of mental calmness. 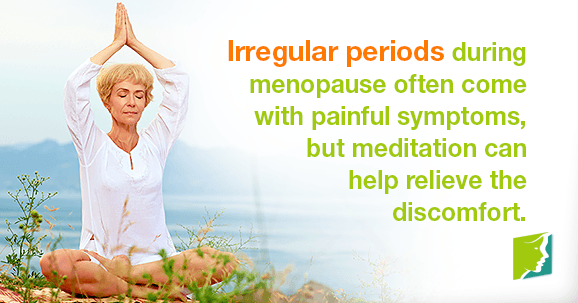 Irregular periods during menopause often come with painful cramping. Meditating relaxes the body as well as the mind, and could physically relieve your discomfort. The practice also focuses the mind to deal with distractions and sensations in the body; this may help you to cope with painful cramps and override them mentally by concentrating instead on the energy of your thoughts and emotions. Begin by setting a mood. Choose a place to meditate where you feel at peace and set aside time to avoid distractions from the demands of your lifestyle. There are specific meditative postures depending on the type of meditation involved, but what's most important is that you are comfortable. Now, focus your mind. It may help to concentrate on a mantra, an object, or the sensation of breathing to help you relax. Accept thoughts and distractions that creep in without judgment, but gently push them aside and maintain concentration on your energy and state of being. Like trying to get to sleep, meditation cannot be forced; approach the process as an opportunity to unwind rather than a discipline to master. Essentially, the most successful form of meditation is the one which works best for you and your lifestyle. Use positions and mantras you feel comfortable with, and don't be afraid to try meditating in different locations (e.g., in a park or on a beach) to find a peaceful environment. Taking time out of your day to relax is an invaluable process not just for managing menopause symptoms, but also for resting your body and mind, to rejuvenate, and achieve a state of contented calmness. Read about home remedies for irregular periods.